Inspired by the exterior illumination on Philadelphia’s Mann Center for the Performing Arts, a York, Pennsylvania resident recently pursued his own professional lighting solution to brighten his hilltop property. Walking into local lighting integrator Production Express, Inc. unannounced, this customer aimed to illuminate massive trees lining the driveway approaching his home with a professional solution. Martin Exterior 100 lighting fixtures were installed to meet the customer’s high expectations. Initially, only three trees were going to receive the lighting treatment, but once the Martin Exterior 100’s were installed, the customer demanded all the property’s trees be illuminated. 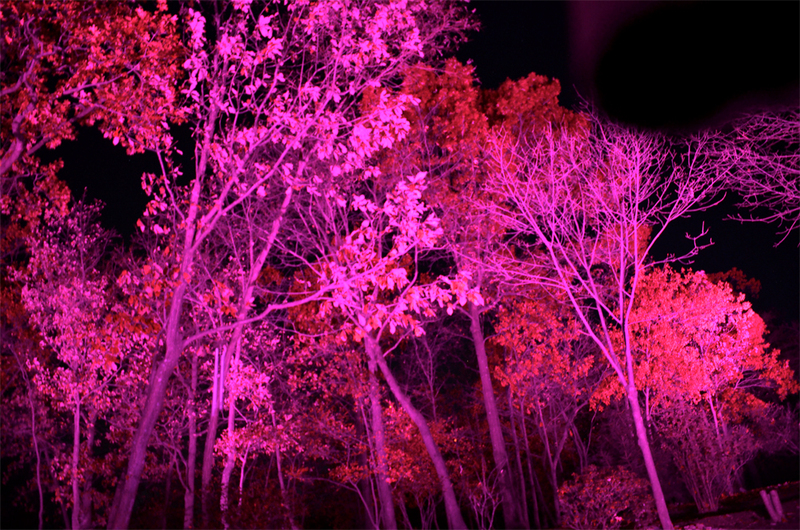 A total of 20 units shine on the trees along the driveway – a light so bright, that on a clear night, neighbors up to three miles away can view the art. The landscape is controlled automatically by Martin MX Manager and runs off of Martin MPC. The lights automatically engage at dusk and deactivate at 5am for a nightly show.